MERRIMACK – The high school season was a blur for Cody Pfeifer, a painful blur. Thankfully for the Merrimack High School senior-to-be, there is American Legion baseball. Playing third base, Pfeifer has been nothing short of sensational for Post 98, which is 6-4, hunting for a District B playoff spot. “Unfortunately, I just didn’t hit that well in high school,” said Pfeifer, noting the average was somewhere around the .160s. This summer, though, with wooden bat in hand, Pfeifer has simply tore it up, hitting .480 to date and playing a superb defensive third base. Pfeifer is happy coming to the field this summer. Post 98 is a solid bunch. Pfeifer is ready for a bit of an adjustment in the fall. He won’t be playing football, as a measure to guard against injury. But with every door that closes … Well, Pfeifer has decided he’s going to give hoop a shot for the Tomahawks this winter. The mad scramble for one of the four American Legion District B playoff spots is on. doubleheader. The result … a tough, tough afternoon for Merrimack Post 98. Derry scooped up both wins, first 8-1 and then, 3-0. The sweep puts Merrimack at 6-4, right in the thick of a four team scramble with Derry, Nashua and Dover for the three spots below 8-1 Rochester. Derry moved to 9-3 with the results Wednesday. 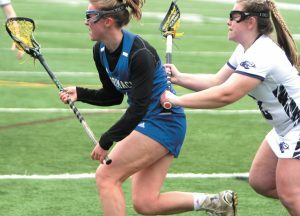 Merrimack did its best to gift-wrap Game 1, committing seven errors in the loss. About the only part of the contest that went well was the bottom of the first when Justin Grassini led with a single, stole second, moved to third on Nick Dutton’s selfless two-strike, right-side infield groundout and then waltzed home on a bomb double to left by Cody Pfeifer. “Things were going our way with the big hit, but we just were flat the rest of the way,” said Pfeifer. Starter Pat Harrington strolled through the first four scoreless frames, despite needing to pick up extra outs because of the defense. But the pitch count rose, and Derry finally took advantage with four in the fifth. Harrington left with two outs in the frame, trailing 4-1, and deserved a better fate. In the fifth, Derry put it away when Connor Jenkins launched a three-run triple. That offensive eruption was plenty for Post 9 southpaw George Welch, who settled in brilliantly in his six innings of work. Milford’s Jamie Pare got the start for Merrimack in Game 2 and pitched well, but again Post 98 put up little offense against Derry’s David Unkles, who spun a five-hitter. Alex Thornton had two of the Merrimack hits. Bishop Guertin’s Taylor Proulx had a big day offensively with two hits in the opener for Derry and a key RBI in the nightcap.